Imagine a universe composed entirely of razor blades, each a living soul, whipping at light speed through the vacuum of space. Passing each other with a lightening-like pace, slashing and ripping the fabric of night, two seem to hover in place, blocking each other with perfect precision. Two fine lines create an impassable barrier of inescapable importance. It is here that the boundaries of imagination unfold. It is here that two minds co-mingle with heightened intensity. Robert Calkin and Joe Ballard are those razor Blades. The result: The Legacy Of The Hand. Legacy of the Hand is a 52 page comic which embodies hilarious comic madness. Witness the spectacle of social commentary that is the Hand as he becomes the foil of several well-known American archetypes (bikers, pedophiles, Klansmen). 1. 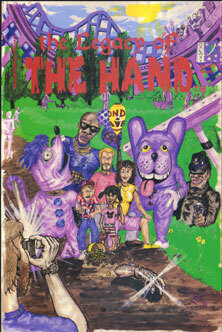 FILM A VERSION OF THE HAND : Use the comic as a storyboard and send it to us with a release form. 2. Make a special effect sculpture of the Hand (complete with gear) and send us a photo.